From CreateTV: Mark Bittman is many things: the author of the humbly titled How to Cook Everything, a New York Times columnist and a world-class, but loveable, curmudgeon. Mostly, though, he is right (or so he says). In How To Cook Everything: Bittman Takes on America’s Chefs, he puts this bold claim to the test, going one-on-one with some of the country's most talented chefs. Deflating overblown egos like falling soufflés, Bittman counters top American chefs’ creations with simple, straightforward recipes. 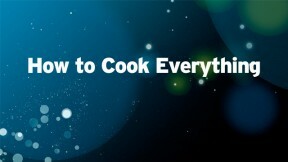 He demonstrates how preparing delicious, eye-catching cuisine need not be a difficult or intimidating process. The result is 13 half-hours of good food and fun.